1 day before they deposit. Must have an available passport or valid I.D. SPECIAL OFFER : Stay 3 nights - Get FREE laundry! With small, medium & large dorms, double and single beds we can provide accommodation for every budget. 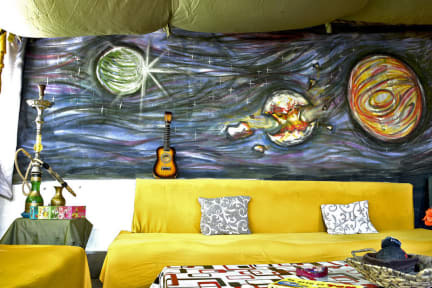 You will enjoy staying in unique hostel, with comfort and creative interior design with painted walls surrendered with music, fun, positive vibes..
We offer full service hostel open 24/7, where you can chill out, sleep & rest on clean sheets, take a shower, dine, surf the web, enjoy a cup of coffee in our beautiful backyard or on the rooftop chill spot with a view on mountain Vodno, meet new friends from all around the world & at the same time enjoy friendly prices that will save your money. We don't treat our guests as a number but rather look forward to meeting new people with different backgrounds, stories and experiences. 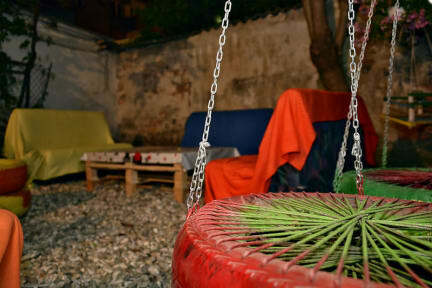 Its our guests who make our hostel worth it! Os recepcionistas são muito atenciosos. Me senti em casa.